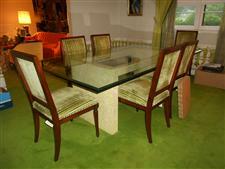 McDaniel Furniture Services presents: Faux marble base and glass top dining table with 8 side chairs. Chairs are covered in a striped velvet. There is also a beautiful buffet to coordinate. See buffet information in another listing.